The Feast of All Saints is on November 1. The Book of Common Prayer, however, permits it to be celebrated on the Sunday following November 1. The collect and readings for the day may be found here. The appointed gospel is Luke 6:20-31. If you are poor, hungry now, or weeping now; if you are hated, excluded, and slandered things are going to get better. You will be blessed. But if you are rich, full, and laughing; if you are respected and others speak well of you then look out. Woe to you. You are going to lose it all and get the opposite of what you have. It sounds as if it is either one or the other, blessings or woes. So what is it for you? Which list better describes your life. Is it blessings or woes? That seems like the obvious question. We want to know our fate so pretty soon we begin counting how many times we wept this week and how many times we laughed. We wonder what income level divides the rich from the poor and how many meals and calories separate those who are hungry from those who are full. Where and what is the line between blessings and woes? On which side do we fall? Tears, laughter, income, and calories do not draw the line between blessings and woes. You and I draw that line. We draw that line every day of our lives. The difference between those who receive blessings and those who receive woes is not about what or how much you have. The difference is an openness and willingness to live for something beyond this world as it is right now. Woes are promised to us who are comfortable, satisfied, and secure not because we are rich, full, and happy but because we are self-satisfied. Our self-satisfaction almost always attaches us to things as they are and then we do all we can to keep it that way. Our life becomes self-contained. There is no openness and receptivity to a new life or a new world. We have no need to look beyond ourselves. Woe to us who are convinced that we have no needs beyond this world. Woe to us who are convinced we have no need to change. Blessings are promised to us who are empty, weak, and grieving not because there is any glory in poverty or misery but because we are open, receptive, and looking for a new world. We have nowhere else to turn so we look for something other than the values of this world to rule our lives, provide meaning, and establish identity. We need something different from things as they are. We may live in this world but we look toward and hope for another world. Jesus is not describing a system of rewards and punishments. Jesus is not rewarding some with blessings and punishing others with woes. He is describing two ways of living and their consequences. We either live for this world or we live beyond this world. It is a choice we make everyday of our lives. We choose our blessings and our woes. Truthfully, we are not one or the other, a people of blessings or a people of woes. We are both at the same time. We could all name a time when the circumstances of life left us so empty and desolate, spiritually and/or materially, that we have to look in a new direction. We had to open ourselves to a new way of being. We were in that moment receptive to God’s blessings and presence. Likewise, there have probably been times when success, accomplishments, or reputation, again either spiritual and/or material, left us feeling pretty rich and full of ourselves. Woe to us who attach ourselves to what is temporal, passing, and changing. 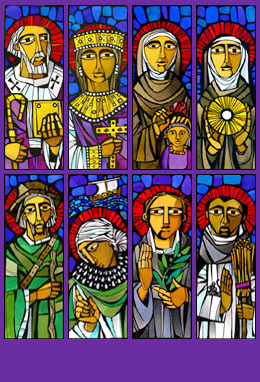 The saints we remember and honor today are people of blessings and woes. They faced the very same choices we do. They are special, set apart, and different from others but not because they are God’s little overachievers, because they prayed all the time, had perfect doctrine, were always good and did what was right. They are holy ones, blessed, not because of what they did or had but because of who they needed, who they allowed to rule their lives, who they lived for, and sometimes who they died for – Jesus the Christ. Their blessing arose from their need. Poverty, hunger, mourning, exclusion and defamation, sometimes spiritual, sometimes material, freed them to live expectantly for the Kingdom of God. If we, like the saints, can truly listen to the deep need within us, not be too quick to fill it up by our own doing, it will guide us into holy living. It detaches us from this world and opens us to an alternative reality, enabling us to live lives that reverse the values of this culture: loving our enemies; doing good to those who hate us; blessing those who curse us; praying for those who abuse us; turning the other cheek; withholding nothing as our own; and giving to those in need without judgment or ridicule. We do to others as we would have them to do to us. So what is it for you, blessings or woes? I choose “woes” in solidarity with the poor. I am in China on a temporary research project and lecture tour. I hope to be back in Haiti soon. Blessings on your work Fr. Dale. While the attitude that you describe of looking forward to God’s change and being open to the Holy spirit is vital, it is also important that we remember to live joyously. This doesn’t mean we should feign happiness when life is tough, but it means we should always be open to the wonder that God creates in the world. Notice the love, the beauty, and the joy that surround us. The gospels paint a picture of Jesus as a man who rejoices in life and is passionately in love with his God and father. Following Jesus’ example, we are called to remember that we are also blessed and beloved children. Admittedly, as you point out, we should admit that we are fallen and strive to more fully grow into the Children that we were created to be. However, it’s unhealthy for us to become too focused in our own miseries, guilt, or unhappiness. We need to have the desire to more fully come to love God and the desire to see our world transformed into his kingdom, without obsession about our own woes. Obsession with our own woes leads to a type of self-idolatry where our focus turns inward and we lose sight of God and our neighbors. I sincerely pray that we can live with the openness of those who are woeful and with the optimism and joy that God’s promises allow us. Mark, I agree that we should not become attached to the circumstances of our life whether we consider them good or bad. In this text, however, I hear Jesus speaking about woes not as the object of our attachment but as a consequence of attaching to our riches, fullness, and satisfaction. The woes arise from what you so well named as “self-idolatry where our focus turns inward and we lose sight of God and our neighbors.” I appreciate the attitude of openness that you describe. That, I think, is the distinction Jesus is making. “God’s little overachievers”! Thank you for making me laugh! what is the difference between self-contained/ self-satisfied and contentment that Paul spoke about in Philippians? If we are content, then we would desire for more of God? Or is Paul specifically talking about physical? Nicole, for me self-contained/self-satisfied describe something closed and solid. It isolates. It’s attached to a particular set of conditions or circumstances. It’s static and fixed. Whereas the contentment Paul describes is an inner contentment that is not attached to or determined by the outer circumstances. It is open and organic. It’s dynamic and unfolding. How do you see the differences or similarities? Thanks Fr. Mike. for the food for thoughts. I guess I have not thought about the differences or similarities until I came across your sermon. I know that we are to be content like what the Apostle Paul said. Do you have any articles on how to be content, pls? Nicole, I don’t recall any articles specifically on contentment. Maybe one way to think of contentment is as peace or balance. When I am content I am at peace and my life feels balanced. That is an inner quality, a way of being more than a response to what is going on around me. I think gratitude has a way of helping us be content, peaceful. One practice might be to identify and list our gratitudes of the day – not only for the things that we would judge as good or desired but also for those things that challenge us, that cause us to rethink our life and beliefs, that ask us to face ourselves. Both situations are making some call or invitation on our life. I don’t think that contentment necessarily means giving up or resigning ourselves to whatever is going on. However, I do think it has an aspect of accepting what is. Maybe Paul is describing a way of being present to and responding to what is. It means we live in this moment and are neither bound to the past nor living too far out in a future that does not yet exist. If contentment has to do with a sense of balance then discontentment is our imbalance. The question then is, what will help you rebalance? What is the difference between self-satisfied/self-contained and contentment that Paul spoke about in Philippians 4:11-13, pls? Or is Paul specifically talking about physical? If we are content, then we do not desire about things of God? Thanks.